There’s good reason why Moon River Music Festival sold out within eight hours of tickets going live. Perhaps it’s how the scenic venue, Coolidge Park, overlooks the rambling Tennessee River. Or maybe it’s the sheer bounty of local craft beer and distillery vendors, all prepared to pour the perfect drink for you to toast to summer’s end. Likely, it’s the chance to see big-name, indie-folk headliners, The Avett Brothers and The Head And The Heart, play a relatively intimate festival. Whether you’re packing your bags for the riverside weekend come September 8th, or jamming out to the Moon River Festival 2018 Spotify playlist from the comfort of your own backyard, here are three artists to watch out for while anticipation for the headlining acts continues to bubble. Margo Price: Those who ache for country radio to sound more Loretta Lynn than bubblegum pop will be rushing over to the Popular Stage on Sunday evening to hear Price in all of her honky-tonk glory. Listening to Price’s unmistakable vocals is like stumbling upon a vintage treasure in an unsuspecting pawn shop. However, her latest album, All American Made, is anything but stuck in the past. Her lyrics fixate on the modern-day struggles of blue-collar, small-town Americans. Price and her band, the Price Tags, are no strangers of the road, having shared stages with the likes of Willie Nelson, Emmylou Harris, and John Prine. Festival-goers can expect Price’s signature blend of infectious energy and intimate storytelling from her Moon River set. The War and Treaty: Musical duo and married couple Michael and Tanya Trotter possess the kind of goosebump-inducing soul sound which few can attain and all can marvel at. Both are power-house vocalists, yet neither overpowers the other, thanks to a charismatic ease that surges through their music just as powerfully as the funky flair that stamps their blues-roots music. Their performance on the Iris Stage on Sunday will only be a day shy of one month since their latest album, Healing Tide, was released. Micheal Trotter wrote all eleven tracks, and if the studio versions are any indication of their live performance, fans can expect an explosively powerful set that will get feet moving and hearts swelling. 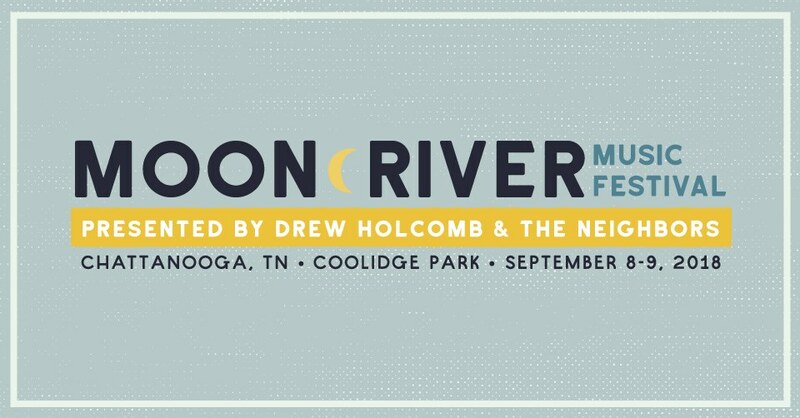 Drew Holcomb and The Neighbors: Ticket-holders may recognize Drew Holcomb as the festival’s very own host and producer, who conceived the idea for Moon River out of a desire to celebrate the beauty of Holcomb’s home state and its array of talented troubadours. Holcomb and his band embody the gentle Americana sound and delicate songwriting that makes up the core of what attracts fans to the folksy genre. There is a warmness to Holcomb’s music not unlike that of an old friend that will remind fans exactly why they chose to get lost in this whimsical world of music and nature in the first place. Festival-goers won’t want to miss a rousing sing along to the fan-favorite song, “Tennessee,” Saturday night at the Popular Stage. Whether you come to Moon River following long-time favorite artists or are unfamiliar with this year’s lineup, there is an long list of talented musicians waiting for you to let their songs join the soundtrack of your best memories. Find all festival information here.